Thomas Arthur East enlisted on 15th June 1909. His two numbers confirms that he joined a Territorial Battalion of the East Yorkshire Regiment. The Territorials had been formed on 1st April 1908 after the disbandment of the Volunteers and the Regiment had two Territorial Battalions; the 4th and 5th (Cyclist) Battalions. On enlistment Granddad was given the number 963. At that time soldiers received Regimental not Army numbers. To complicate things Territorials had separate number sequences to their comrades in the regular Battalions of their Regiments. From April 1908 men of both 4th and 5th Battalions were each numbered from 1 upwards. Men initially enlisted into the Territorial units for four years and after completing their four years, they could, if they wished, re-enlist for a further one to four years further service. Re-enlistment could continue until the age limit for service was reached. The East Yorkshire Regiment had a Regimental Journal (The Snapper) and the July 1914 edition recorded that Lance Corporal T East (with others) had re-engaged for further service in 4th Battalion East Yorkshire Regiment. All Territorial soldiers were called up for full-time service on the outbreak of war in August 1914. Although it had been intended that Territorial units in wartime would take responsibility from the regulars for home defence; it was soon decided to ask Territorial soldiers to commit to overseas service. Most volunteered and Granddad must have done so because when his Battalion went overseas in 1915 he was with it. Shortly after the outbreak of war the number of men enlisting was so great that new Battalions were formed. The 4th and 5th Battalions were designated 1/4th and 1/5th and new 2/4th and 2/5th Battalions were formed. The 1/5th (Cyclist) Battalion spent the war on coast defence duties in Lincolnshire and Yorkshire. The 1/4th Battalion however was sent to France in April 1915 as part of the York and Durham Brigade of the Northumbrian Division (subsequently 150th Brigade of 50th Division). Granddads Medal Index Card shows that he entered the ‘Theatre of War’ on 17th April 1915; the day 1/4th Battalion East Yorkshire Regiment landed at Boulogne. This confirms that Granddad had been in 4th Battalion prior to the war and in 1/4th since the war began. By landing in France in 1915, Corporal East, as he then was, qualified for the bronze 1914/15 Star which was authorised at the end of the war. 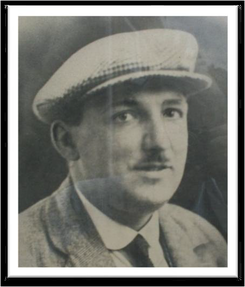 His entitlement to the Star meant that he automatically qualified for the silver British War Medal 1914-20 and the bronze Victory Medal 1914-19 when they were subsequently authorised. The roll for the latter two medals confirms that he saw active service with 1/4th Battalion only. On landing in France 50th Division was quickly transported to the Ypres Salient. The 2nd Battle of Ypres was underway as the Germans tried to break the British line and reach the Channel coast. The Germans used poison gas in that fighting. 50th Division was heavily involved in the Battle of St Julien from 24th April; part of the 2nd Battle of Ypres. 1/4th Battalion was ordered to attack the German trenches just after 5 pm on 24th April. The Battalion came under heavy shell fire and the attack stalled with numerous casualties. With darkness the survivors pulled back to Potijze. The following morning the Battalion moved to new positions. It was under shell fire all day and this continued until the beginning of May. The 1/4th Battalion was involved in the Battle of Bellewaarde Ridge on 24th/25th May with 29 casualties. 50th Division remained in the Ypres salient for the rest of 1915. No major actions took place after the spring fighting. All the British positions were overlooked by the Germans who were able to fire onto the British positions and cause a steady stream of casualties. The 50th Division remained in the Salient until after the start of the Battle of the Somme. In August 1916, the division began to move south towards the Somme. The 1/4th Battalion East Yorkshire Regiment was one of the attacking Battalions on 15th September at Flers Courcelette. British tanks were used for the first time in the battle. The attack was unsuccessful and British casualties were high. 1/4th Battalion East Yorkshire Regiment was removed to the rear areas on the evening of 16th September having had 250 casualties. A further 30 casualties were incurred at the end of September during the Battle of Morval. Further fighting took place in October, during the Battle of Le Transloy Ridge. At some stage, late in 1916, Granddad was wounded. The Regimental journal of January 1917 includes Sgt East in its list of wounded. Nothing is known as to the severity of his wound of which he never spoke of, but it is possible that the local Hull papers may give further details. I did try to find any such reference, but had no luck. During the war local newspapers regularly carried about a page per issue on local service men who had been killed or injured. Often quite considerable detail was given. After recovery from his wounds, granddad returned to 1/4th Battalion East Yorkshire Regiment. The 50th Division was involved in the 2nd Battle of the Scarpe, on the first day of which (23rd April 1917) the 1/4th had 369 casualties. The next major action of the Battalion was during the big German spring offensive (Kaiserschlacht) which began on 21st March 1918. In the first two days of the attacks the Battalion lost almost 50% of its strength. Fighting continued and the British were pushed back many miles on a large front and also lost many tens of thousands of men killed, wounded and captured by the end of March. By the 1st April the Battalion’s strength was three officers and 66 men. The East Yorkshire Regiment was reinforced to 16 officers and 639 men. Between 9th and 11th April, 1/4th was still attempting to resist German attacks near Estaires and after three day fighting was reduced to three officers and 120 men. By the end of April several British divisions were taken out of the line to rest and recover, to receive reinforcements and to train. The 50th Division with others were sent to the French area of operations as being a ‘quiet’ area. Unfortunately the next German offensive was to be launched in that area. Between 26th and 27th May 1918 the Battle of the Aisne took place. Once again huge German forces attacked and the British forces were pushed back. After two days the Battalion had been reduced from 30 officers to four and from 642 men to 105. The Battalion saw no further action in the war. 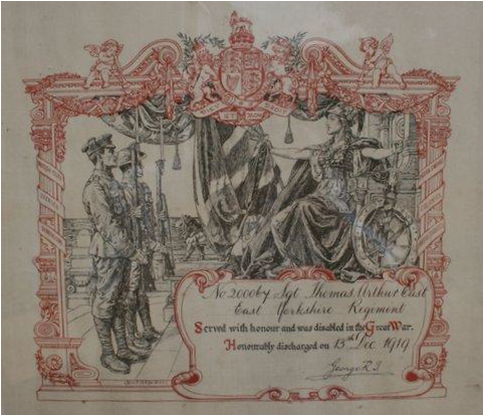 Granddad was discharged from the Army on 13th December 1919 and awarded a Silver War Badge. The badge was awarded to all servicemen who were honourably discharged on the grounds of age, illness or wounds. The badge was intended to show that a civilian had served his country. Granddad together with my Grandma, Mary Jane Dobson started a family in 1916. Harold (b1916), Frank (b1918) Chris (Member 229) and Philip (Member 243), Dad, Ronald (b1920), Constance (b1922), Leonard (b1924), Mabel (b1930) and the baby of the family Arthur (b1933). My Dad, Harold, then went on to marry Phyllis Andrew (b1918) who started their family in 1945. Lynda was the first, followed by me in 1947 and Pat in 1949. Paul married Carline in 2006 and had three children Tom (b2007) and twins Chloe and Elliot (b2009). Helen married John in 2007 and had two children Evie (b2011) and Callam (b2014). Beth married Phil in 2009 and they now have Molly (b2010) and another due in October. So this family tree would not exist today if that German soldier had been a better shot nearly 100 years ago.